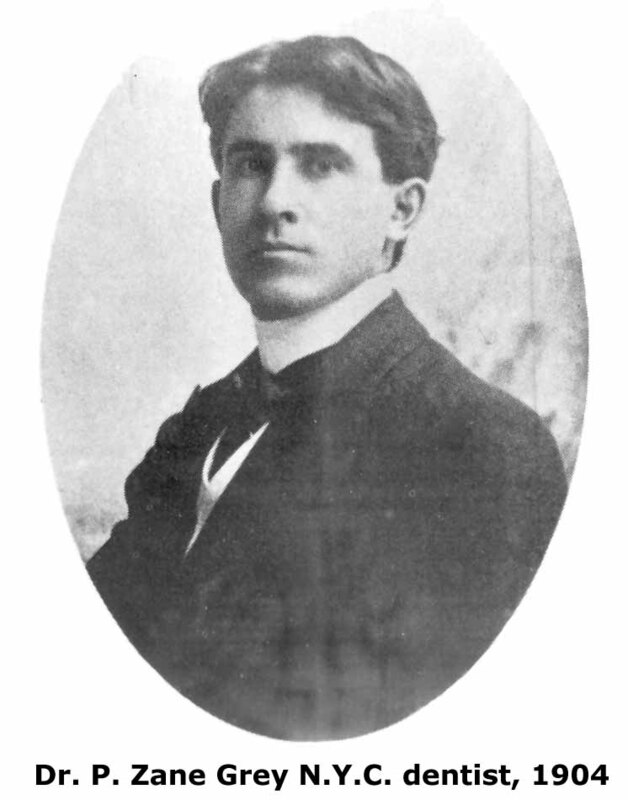 Pearl Zane Grey (1872-1939) was born in Zanesville, Ohio, a city named after his maternal great-grandfather. As an adult, he dropped his first name, and is still better known as Zane Grey. Even someone like me (whose entire knowledge of the Western genre comes from The Wild Bunch, the Coen brother’s True Grit, and Back to the Future: Part Three), considers Zane Grey synonymous with Westerns. Grey grew up in Columbus, Ohio and attended the University of Pennsylvania on a baseball scholarship. After graduation, he followed in his father’s footsteps and became a dentist, opening his practice in New York City. With the help of his soon to be wife, Lina (better known as Dolly), Grey self-published his first novel, Betty Zane, in 1903. He published eight more books before 1912, when he published his most famous and commercially successful book, Riders of the Purple Sage. In all, he published over sixty books in his lifetime and more than thirty posthumously. So what's this book about? 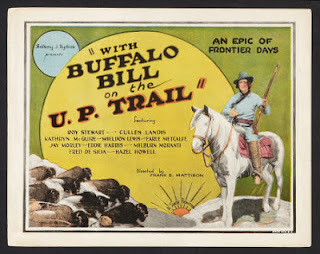 The U. P. Trail takes place in the late 1860’s during the building of the Union Pacific Railroad, the first to connect the east coast to the west. The story centers on Warren Neale, a railroad engineer, his gunslinger friend Larry King (who is fortunately referred to as “Red,” although the image of a bespectacled, suspendered fast-draw artist is entertaining), and the love interest, Allie Lee. While laying out the course of the railroad, a trapper named Slingerland arrives looking for help. Neale and Red come to the aid of a wagon caravan heading east that had been attacked by a Sioux Indian war party. With the exception of Allie, who had been heading east with her mother to escape her gambler step-father, all the travelers had been killed. Neale falls for Allie, who, when she comes out of shock, feels the same. The characters are all archetypical Westerners. The mysterious gunslinger; the plucky damsel in distress; the lone woodsman; the chivalrous hero; the heartless gambler, etc. Within their roles as characters in a Western, they are consistent and have enough individuality to make them barely three dimensional (usually). Grey’s description of the land is probably the best part of the book. He writes with a lot of emotion, some of which invariably impresses itself on the reader. Unfortunately, the events in the story seem contrived. There are series of chance encounters and coincidences that stretch too far into the realm of implausibility. While I can’t speak from a background in Westerns, The U.P. Trail seems like pretty standard fare for the genre. Why was it so popular? Zane Grey had appeared in the top ten on the bestsellers list twice before the publication of The U.P. Trail. Since the publication of Riders of the Purple Sage in 1912, his popularity had been increasing. If one thing is certain, it’s that previous popularity is a strong force for getting to the top of the bestsellers list. Likewise, a history in film helps. His work has been adapted for the screen over 100 times, since 1911. It’s possible, too, that a purely escapist story set in a different time period would appeal to a populace engaged in one of the largest wars in history. Why haven't I heard of it? Zane Grey is more famous than any one of his novels individually. With the exception of Riders of the Purple Sage, there doesn’t seem to be any specific Zane Grey novel that has become, and remained, remarkably notable. Zane Grey’s work overall is still significant as a large part of the foundation for the Western genre. The U.P. Trail is pure escapism with a little bit of history. As someone who isn’t a fan of Westerns, I can’t say I enjoyed it much. 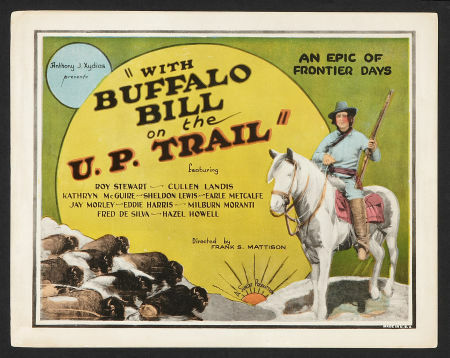 But if you enjoy Westerns and are looking for escapism, The U.P. Trail seems like a good choice. You can read The U. P. Trail on Project Gutenberg. Grey, Zane. The U. P. Trail. 1918. Roslyn, New York : W. J. Black. 1946. Print. Gruber, Frank. Zane Grey: A Biography. Roslyn, New York: W. J. Black. Print. I enjoy western movies, but haven't yet tried the books. I don't ordinarily read Westerns either (McMurtry's Lonesome Dove being an exception) but this was a lot of fun. Yes coincidences abound. For such a big country, characters seemed to turn up in the same place whenever the author needed them to. The plot certainly followed the standard boy-meets-girl, boy-loses-girl (several times, in fact), boy-gets girl storyline. The building of the railroad details and, as you say, the scenery, added a lot to the book. As with all of these books so far, I am astonished with the causal racism. More than the earlier books in your list in fact. There was a racial slur for just about every minority you can think of: blacks, American Indians, Irish, Italians, Chinese, Texans, whatever. Happy Birthday Bret Easton Ellis!